From John Menadue’s blog, Pearls & Irritations, 10 July 2017. The release by Newcastle University’s Centre for 21st Century Humanities of a map of colonial frontier massacres has attracted a burst of media attention. It draws national interest back to those questions that were highlighted during the history wars of a decade and more ago. The ongoing Newcastle research project is one of many similar ventures which have returned to the fraught question of Australia’s frontier wars. New relevant research has been pursued all over the country in Queensland, Tasmania, the Northern Territory, South Australia, and Western Australia, although not all of it is readily available to the interested reader. Broadly speaking, the new scholarship, in most cases pursued independently, draws us towards a new consensus. The Australian frontier was a violent place. Conflict erupted around the fringes of settlement from the last years of the C18th until second and even the third decade of the C20th. The pioneer ethnographers Fison and Howitt observed in 1880 that the advance of settlement had been marked by ‘ a line of blood.’ It was a reality that was hidden away and then forgotten during the first half of the C20th. Generations of Australians brought up with a sunny, anodyne version of the national story were shocked when historians returned to truths that had been self- evident to their ancestors. Their hostility to the revisionist history was fully predictable. The Newcastle map summarises work in progress, concentrating on South-eastern Australia up until 1872 and dealing with incidents resulting in the death of six or more individuals while coping with all the problems of fossicking out credible evidence. But it is a valuable addition to the new historiography and two of the abiding questions: how many people died? Was it warfare and if so how do we deal with it given the deep sanctity which surrounds the phrase’ Lest We Forget’ and the present day apotheosis of the warrior? At the centre of these intense controversies is the question of warfare. Are we dealing with war or something else? And if it was war how does this sit with our endless commemoration of overseas conflicts? 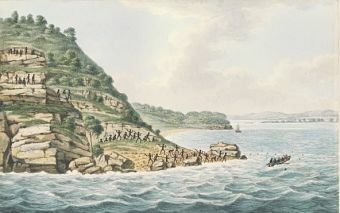 Aborigines with spears attacking Europeans in a rowing boat, Joseph Lycett. UCL News. flickr cc. There were always people who thought the settlers were engaged in a war although they usually qualified their observations with recognition that it was war of a distinctive kind. But there have equally been observers and historians who dismissed the idea out of hand. Fighting, while common, was too scattered and sporadic. It accorded more with such essentially a-political forms of conflict as banditry, crime or even piracy. It was about theft of property, trespass, disputes over women and personal revenge. But while such assessments are understandable they are no longer tenable and have not been so after the High Court’s Mabo judgement in 1992. With the overthrow of Terra-Nullius everything changed. Once there was such a powerful, authoritative recognition of indigenous property rights and by implication Aboriginal and Islander sovereignty, frontier conflict took on a totally different aspect. It was inescapably about the ownership and control of property on a continental scale. It was also about whose law and whose sovereignty would prevail. The battles may have been more like skirmishes but they were essentially political and they were cumulatively about the ownership and control of one of the world’s great land masses. It was therefore a war of global importance. It was war about Australia fought in Australia. It was arguably the most important war in our history. 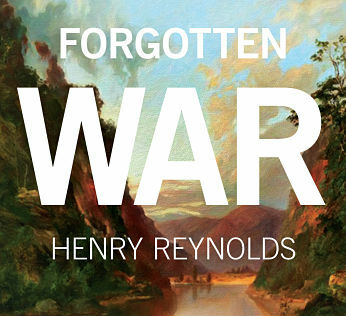 Henry Reynolds is an eminent Australian historian, who has focused on frontier conflict between indigenous people and European settlers. His latest book Unnecessary Wars was published by New South Publishing.